At last Monday’s town hall meeting on a proposed NFL stadium and convention center expansion downtown, AEG president Tim Leiweke said that revenue from advertising signs on the convention center facade would help pay debt service on the nearly $300 million in bonds the city would issue to finance that expansion. But even though Leiweke spoke of commitments and guaranteed revenue from advertisers, that signage proposed for the freeway-facing facade at the heavily trafficked confluence of the 10 and 110 freeways has never been approved by the city council. In 1998, the city gave the exclusive rights to signage on the city-owned convention center to AEG, the owner of the adjacent Staples Center and L.A. Live, and in 2008 it approved a sign revenue-sharing agreement that would give the city a minimum of $2 million a year. But the details of sign sizes, types and locations had to go through planning department review and public hearings at the City Planning Commission ((CPC) and council’s Planning and Land Use Management (PLUM) committee before being voted on by the full city council. The original sign plan submitted by AEG proposed more than 50,000 sq. ft. of billboards and electronic signs, including signs covering the building’s iconic glass entry towers. The planning department recommended reducing that signage, and replacing the freeway-facing electronic billboards with static signs. That version was approved by the CPC in July, 2009, and sent on to the PLUM committee, but it has never been brought up for a vote. 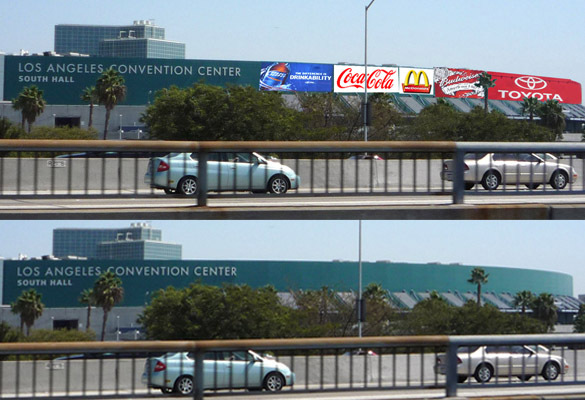 Thus, whatever commitments AEG has from advertisers who want to display their brands on the convention center facade, which is within 100 ft. of the freeway at its nearest point, are based on city approvals that don’t at this moment exist. It’s also unknown if AEG is counting revenue from the original proposal, with its digital billboards directly in freeway drivers’ views, or the more modest version approved by the CPC and still pending in the PLUM committee. Leiweke spoke of the advertising revenue as a key part of protecting the city from any financial liability that might arise from issuance of the bonds. He didn’t say whether the 2008 revenue sharing agreement, potentially worth much more than the $2 million in future years, would remain in force. The only council member who voted against that agreement was Bill Rosendahl, who organized and moderated Monday night’s town hall meeting. At the time, Rosendahl complained that it was a giveaway to AEG, and that bright, flashy signs didn’t belong on the long, curving facade of the building. Councilman Dennis Zine, who wasn’t at the meeting, later said he was also opposed to the signage.